“Somebody here,” said Darlusz Zabagaiski, the Polish frog who lives in my house, as he heard a car door slam in the driveway Thursday evening. 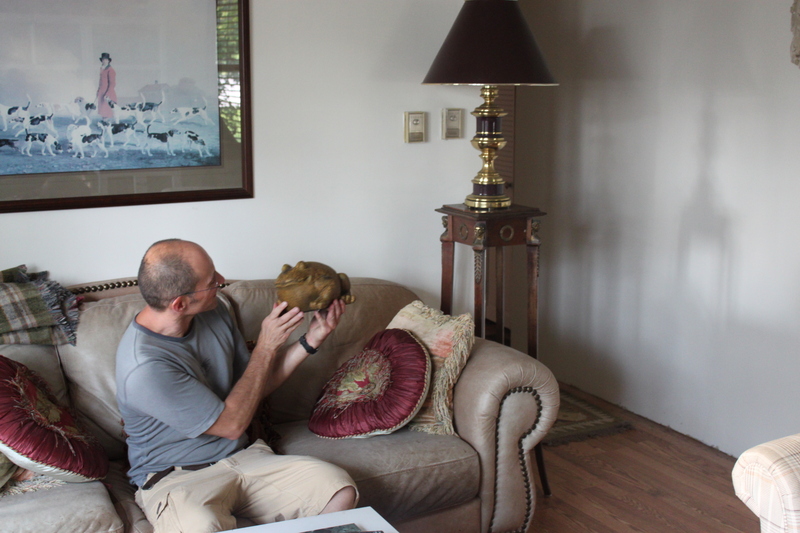 Darlusz the frog explains to Denis about all the nice furnishings Jeff brought to the house as he moved in this month. “Oh, that’s Denis, you know him, my good friend from Jay. I was expected him about now,” I replied. “Oh dat Denis good man. I like when he come here,” Darlusz said. I had very little furniture and very little time to fix the house interior, so it still looked half finished and very empty, until Jeff moved in with his generous amount of stuff. And it’s nice stuff, so the house looks so much better. I actually feel like I live in a home now. Jeff, Darlusz and me greeted Denis, and Darlusz started the tour. “Dat Jeff, look the paintings he put up. Very, very nice, doz paintings,” Darlusz said. An area in my living room that housed just an old TV and a bland entertainment counsel is now a nicely furnished living space. Darlusz is below the TV, checking things out. Denis agreed, looking around. 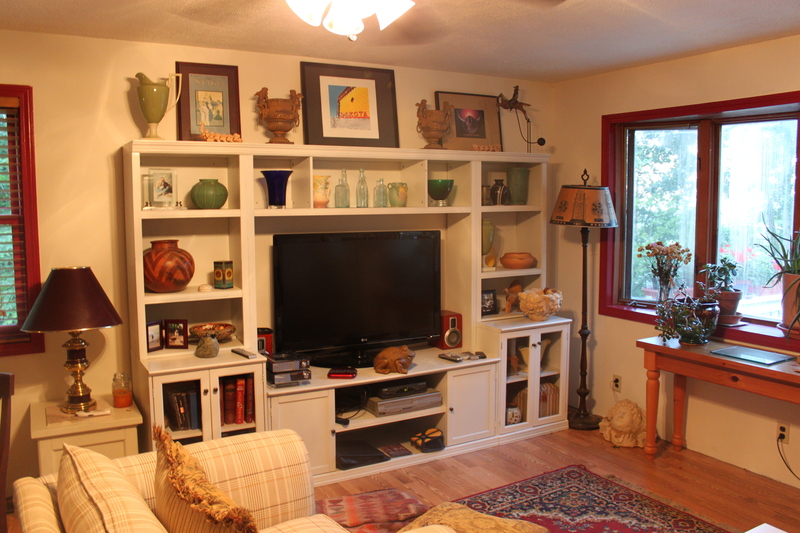 “Wow, it doesn’t even look like the same house,” he said as he eyed comfortable furniture, pleasant rugs, repaired walls and nice touches that Jeff has added. I agree. There’s lots of benefits to Jeff having moved in. Although it’s not the most important reason I’m glad Jeff is here, I have to admit the decor is a million times better. Even Darlusz looked proud and smug at the way the house has turned out. “See, everybody happier,” he told Denis. I could only smile and nod in total agreement. This entry was posted on August 6, 2010 at 10:56 am and is filed under Uncategorized. You can follow any responses to this entry through the RSS 2.0 feed. You can leave a response, or trackback from your own site. DZ! If Denis was over, you should check the silver, make sure Denis didn’t steal any of that or anything else! Wow. Definitely a keeper. Never did get to see the “before” but the after looks like Martha Stewart. DZ already looks spoiled. the house really is stunning and i’m honored i was the first to see the transformation. it seemed like all the furniture and art fit in perfectly, like it was meant to belong there. Darlusz gave me a great tour. …and just for the record, i did NOT steal anything!! !